Rinsankajugin wrote: So this new Shonen Jump fighting game was announced for smartphones today. Any chance the characters in this game might hint to who could appear in Jump Force? Possibly. I see Kira and Ryuk in the crowd, once again implying that they are playable despite comments that they can't be due to them being OP. Jump Force's roster might not be so big, though. The mobile game's art style looks simpler. Making all these chibi-ish characters isn't as challenging as giving them realistic models. And your wish has been granted. But they are SURPRISINGLY in their timeskip (final arc) forms, along with Aizen. I had seen the Japanese site for Jump Force at one point but I can't seem to find it again. Anybody have a link? Battle High 2, starring Kyle Hebert as well as myself, has been released on Xbox 360, OUYA, PC, Linux, Mac, and Xbox One! 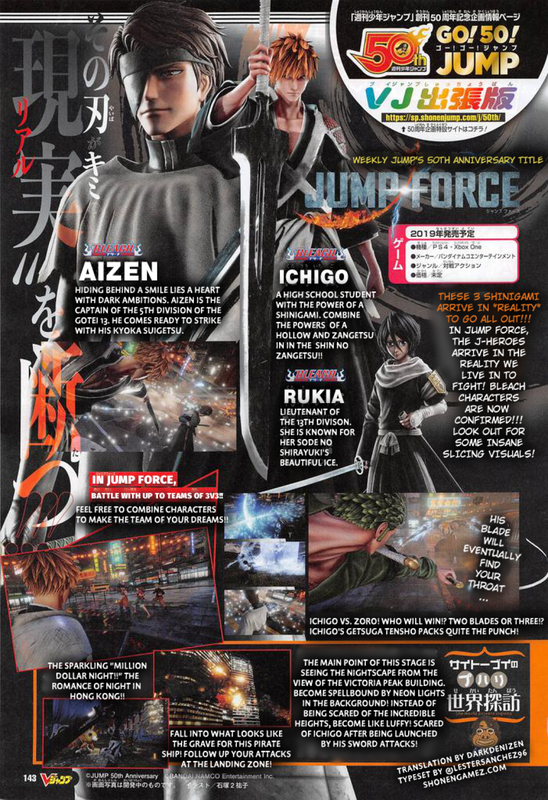 So we've had a new screenshot that shows Rukia clashing swords with Aizen, so...is that a story bit, or is she actually playable this time around? I kept assuming she was just a support character like in J-Stars (especially since they kept only showing her in relation to Ichigo like using him would give you access to a move that called her in or something). Gyt Kaliba wrote: So we've had a new screenshot that shows Rukia clashing swords with Aizen, so...is that a story bit, or is she actually playable this time around? I kept assuming she was just a support character like in J-Stars (especially since they kept only showing her in relation to Ichigo like using him would give you access to a move that called her in or something). Sorry for a technical double post (it's been a few days anyways), but the Bleach characters trailer was released. Also. that Weekly Jump intro feels very Marvel-esque. If there was DLC is there a chance secondary characters would be playable? I really would love to see some classic cel-shade so the characters would look more like their comics and anime selves. Maybe I will watch some videos after this comes out and I think I will pass. Waluigiman wrote: If there was DLC is there a chance secondary characters would be playable? Anything's possible but I think DLC will more than likely focus on main characters. July 9th 2018 will be remembered as the day Broly became canon. I hope it does, I mean who wouldn't want the whole group of Z fighters? Altough it would be too much and maybe too unfair if the other franchises will be outnumbered. Waluigiman wrote: Who wouldn't want the whole group of Z fighters? Altough it would be too much and maybe too unfair if the other franchises will be outnumbered. I'm hoping we'll get more than Goku, Vegeta and Freeza in the base game as the DLC will give us a better roster than the first game. I expect we'll get Trunks and Piccolo at the very least as both are popular and different enough to justify their inclusion. Yep, those two are likely to appear later. New V-Jump scan, shows off more of Gon, Hisoka and the Liberty-Namek stage, but it also reveals Sanji and Blackbeard too! Wow, I wasn't expecting Blackbeard. I was thinking Akainu and Doflamingo, but this is awesome! Definitely gonna play as him. Now...they need to hurry up and show off JoJo, I wanna see who's gonna make it (Jotaro and Dio of course) and how they'll look in this realistic style. "I can't increase my ability through some kind of noisy transformation the way Frost and you Saiyans do. If I wanna become more lethal, I don't have the luxury of cutting corners, I just have to do it the old-fashioned way. Combat is craft. What matters most is not raw power, but the skill by which you hone it." One piece is so far getting 3 new characters (Zoro, Sanji and Black beard) which will bring its total number to 7 assuming the 4 in the first game carry over. DB currently has 3 from the first game (Goku, Vegeta and Freeza) so hopefully we can at least 4 new ones to bring it up to One Piece's number. If they're just using manga characters I'd like to see Piccolo, Future Trunks, Cell and Kid Buu. Naruto also just has 3 so Kakashi, Gaara and Orochimaru would be good additions to start with. It looks like we may be able to create our own character based on who showed up at the very end.